Bayfield is a small-town destination in Northwest Wisconsin, popular for its vibrant summers and fall foliage, breathtaking lake views, and bountiful fruit harvests. But its strategic location between Lake Superior and several state parks and forest reserves make it a fun-filled winter destination, as well. Here are eight snow-filled activities to try on your next visit to Bayfield. When Lake Superior’s freeze-up is in full swing, locals and tourists head down to the bay and carve up the iconic Ice Road from the landing on the northeast end of town all the way to La Pointe on Madeline Island. This allows them to walk, bike, ski, or drive a snowmobile or light vehicle for a wintry excursion. If you’re not into fishing or skiing, you can just hike all the way to the mainland Meyers Beach Sea Caves and witness the enchanting rust-hued sea caves turn into sparkling cathedrals of ice. To catch this rare opportunity, plan ahead and get help from a local outfitter. Check the best date to visit the ice caves as they are closed down when weather conditions are unfavorable. Northwest Wisconsin offers light but invigorating cross-county skiing and snowshoe activities. There are a number of trails groomed for all skill levels. If you’re seeking more thrill, go higher up Mt. Ashwabay where over 130 miles of Nordic ski trails await. If you’re one for a more extreme adventure, head down to Chequamegon-Nicolet National Forest and ride the slopes of the Mt. Drummond Ski Trail. Mt. Ashwabay is the premier destination for some of the best Nordic and Alpine Skiing north of the equator. A host of mountain activities for all skill levels awaits, from family- and dog-friendly hikes to extreme cross-country skiing. Its track-groomed paths are also perfect for snowshoe and fat bike tours. Tubing is also an option if you’re bringing the kids. Visit the Mt. Ashwabay website for more information on fun winter activities. Guided dog sledding offers a unique backcountry expedition through the woods, where an idyllic setting abounds. It’s a perfect activity for those wanting to marvel at the solitude of the region’s snow-covered landscapes. If you want to put your competitive spirit to the test, join Apostle Island’s annual sled dog race. 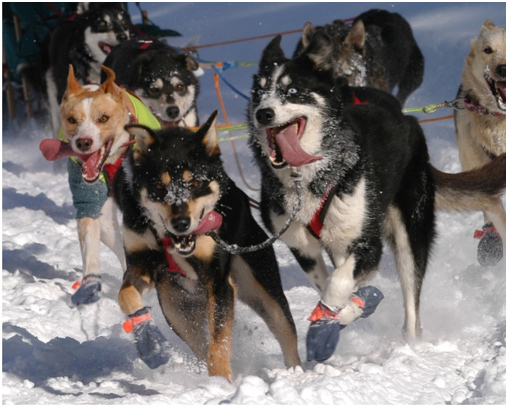 This page provides up-to-date information about sled dog races every year. Competitions and events are also lined up for the entire season. Tourists can mingle with locals, participate in sled dog races, indulge in local and regional grub and culture, or cozy up in front of the fireplace in a rustic lakefront cabin. Take the wildest, most creative polar plunge freezing Lake Superior has to offer during the Bayfield Winter Festival. You’ll not only win awards for creative and the best plunge, you also get to go home with fans and bragging rights, all while raising funds for polar bears or your own organization. To cap off a joyous winter, show your solidarity with the locals by participating in the candlelight walk along the Brownstone Trail, a rich tradition in which locals make their last hurrah before the ice melts. There’s obviously more to this scenic peninsula than Big Top Chautauqua, organic apples, endless lake views, and period architecture. Despite its small-town, laid-back vibe, it stays alive and colorful all year, even through the midst of winter. Make the most of your winter holiday by getting help from the locals. Meanwhile, explore our blog for more insider information about activities in Bayfield.